You'll explore the less-touristy side of things at Archipelago National Park and Oro. To see traveler tips, reviews, ratings, and other tourist information, you can read our Kimito Island trip builder . New York City, USA to Kimito Island is an approximately 20-hour flight. The time zone difference moving from Eastern Standard Time to Eastern European Time is 7 hours. Expect little chillier weather when traveling from New York City in July: highs in Kimito Island hover around 71°F, while lows dip to 52°F. Wrap up your sightseeing on the 20th (Sat) early enough to drive to Turku. You'll discover tucked-away gems like Nagu Church and Kauppakeskus Mylly. Get in touch with nature at The Archipelago Trail and Ispoinen Beach and Sauna. Change things up with these side-trips from Turku: Korpo Church (in Korpo), Vaski Adventure Island (in Naantali) and Louhisaari Manor (in Askainen). There's much more to do: examine the collection at Kylamaki Village of Living History, get a new perspective on nature at Turku Biological Museum, stroll through Kupittaa Park, and let the kids burn off some steam at Adventure Park. For photos, where to stay, ratings, and other tourist information, go to the Turku trip itinerary maker app . Traveling by car from Kimito Island to Turku takes 1.5 hours. Alternatively, you can take a bus. In July, plan for daily highs up to 70°F, and evening lows to 52°F. 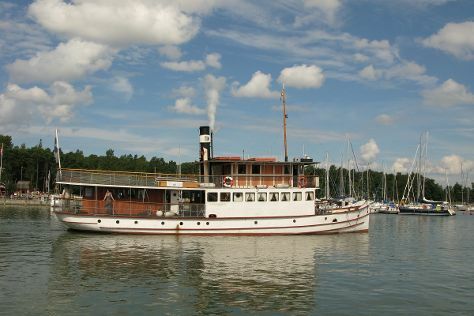 Wrap up your sightseeing on the 26th (Fri) early enough to travel to Uusikaupunki. Start off your visit on the 27th (Sat): pause for some serene contemplation at Uusikaupunki Old Church, then see the interesting displays at Bonk Museum, and then examine the collection at Automobile Museum. Keep things going the next day: take in the waterfront activity at Isokari Lighthouse. For other places to visit, where to stay, reviews, and other tourist information, refer to the Uusikaupunki itinerary tool . You can drive from Turku to Uusikaupunki in 1.5 hours. In July, plan for daily highs up to 70°F, and evening lows to 52°F. Finish your sightseeing early on the 28th (Sun) to allow enough time to travel to Rosala. Start off your visit on the 29th (Mon): see the interesting displays at Rosala Viking Centre and then visit a coastal fixture at Bengtskar Lighthouse. For traveler tips and more tourist information, you can read our Rosala trip itinerary builder tool . You can drive from Uusikaupunki to Rosala in 3.5 hours. In July, daily temperatures in Rosala can reach 70°F, while at night they dip to 52°F. Wrap up your sightseeing by early afternoon on the 29th (Mon) to allow enough time to travel to Salo. Salo is a town and municipality of Finland.It is in the province of Western Finland and is part of the Southwest Finland region. On the 30th (Tue), steep yourself in history at Ruukin kehräämö ja puoti Oy, then sample the tasty concoctions at Mathildedalin Kylapanimo, and then get some fabulous bargains at Muurla Design Marketing Oy. To find more things to do, reviews, ratings, and tourist information, use the Salo route planning tool . You can drive from Rosala to Salo in 2.5 hours. In July, daytime highs in Salo are 70°F, while nighttime lows are 52°F. You'll set off for home on the 31st (Wed).